Mew gulls photographed by, clockwise from bottom left: Christina Meschkat, Mike Yip, John Reynolds, and Maria Shallard. The mew gull can be difficult to identify, especially as seagull plumage changes for up to four years and can be highly variable. This is a small to medium-sized gull that reaches adult plumage in its third year. At three years it has a white head, dark grey back, thin yellow bill, and dark eyes (usually). Its wings are grey with white and black primaries and wing tips. Its head has a brown wash in winter, and it has yellow legs. The plumage of a second winter bird is similar, but with less white on its wing tips and black at the end of its bill. Its head is mottled with brown and its bill may be grey to yellow. The plumage of first winter and juvenile mew gulls is very similar to that of the ring-billed gull: white mottled with brown, especially on their bellies and tails. Their legs are pink and bills are black-tipped. Click here for more detailed descriptions of each year and links to similar gulls. The mew gull is found year-round on the Pacific Coast from southern BC to southern Alaska. It is found further south on the Pacific Coast in the winter, and east across the Northwest Territories and into northern Manitoba in the summer breeding season. 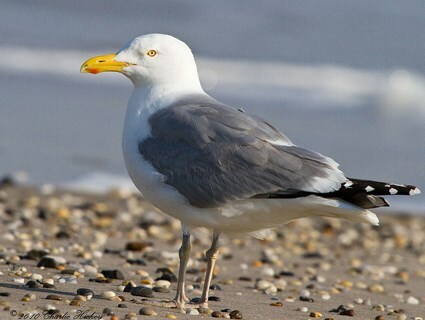 The herring gull is more common in eastern North America than on the west coast, and is much larger than the mew gull. Adults have a red bill spot. 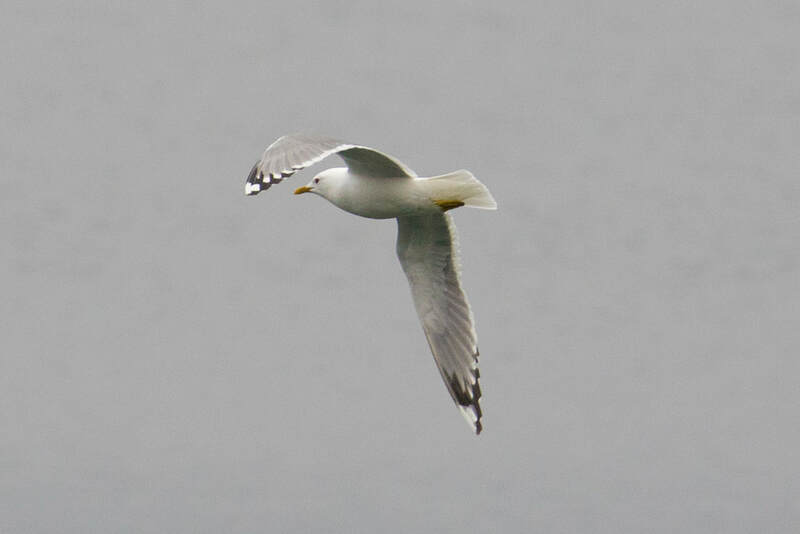 The ring-billed gull is generally not found as far north as the Central Coast, but its range overlaps with that of the mew gull further south. 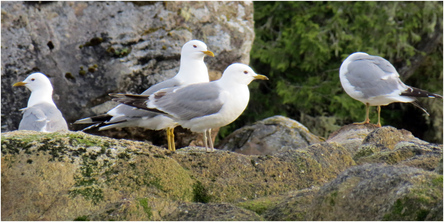 The mew gulls has more white on its primaries than the ring-billed gull, and the ring-billed gull retains a black stripe around the end of its bill. 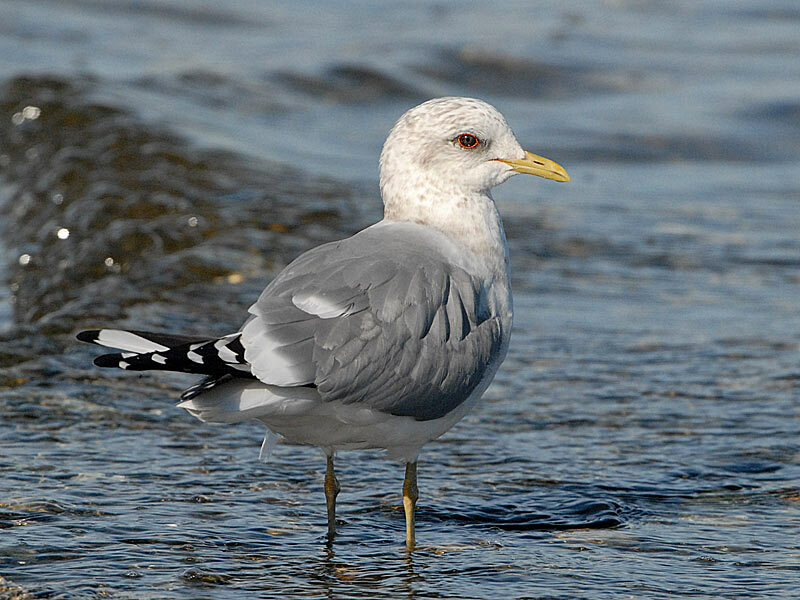 The mew gull is widely distributed across the world, and is usually described as three subspecies: the North American mew gull (Larus canus brachyrhynchus), the common gull (Larus canus canus), found in Europe, and the Asian Kamchatka gull (Larus canus kamtschatschensis). This is the only white-headed gull to nest in trees on a regular basis. Dunn, J. L. and Alderfer, J. (Eds.). (2006). National Geographic Field Guide to the Birds of North America. (5th Ed.). Washington, D.C.: National Geographic Society. Pp. 202-203. Mew gull (Larus canus). The Birds of North America Online (A. Poole, Ed.). Ithaca: Cornell Lab of Ornithology; Retrieved from the Birds of North America Online. Accessed 19/02/2013.